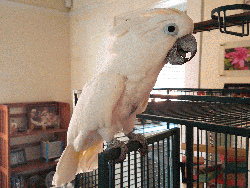 Update from Snowy`s foster home- 10/22/16- Snowy is a 21-year old umbrella cockatoo who has been with his new foster parents for about 2 months. His previous foster dad had some severe health problems, otherwise his former foster parents likely would`ve adopted him. Snowy is a very sweet guy who loves head scritches at any time. He adores getting lots of attention from and spending time with his human flock. His heart belongs to women, but he is fine being cared for, scritched, etc by men as well. Snowy really loves playing with wooden blocks and beads. He is also not picky about play materials and finds any novel piece of cardboard or junk mail to be fascinating. He says "hello" quite a bit, especially at bed time, and he sometimes also says "I love you." He gets 12-14 hours of sleep per night- his cage is rolled into another room and covered with a sheet and he goes right to sleep after vocalizing for a few minutes. Snowy loves dancing with his mom and dad, and enjoys bobbing along when his mom does trampoline workouts. He eats a pretty healthy diet of pellets, fruits (watermelon and grapes), and veggies (tomatoes- I know this is technically a fruit but we count it as a veggie due to lower sugar content, cucumber, squash, and carrots). Nuts and seeds are saved for training only, and his favorites are sunflower seeds and peanuts. Snowy responds extremely well to clicker training and so far, he has learned to travel up to about 5 feet to touch a target (we use a wooden spoon). He tends to be fearful of new things but warms up quickly. He will step up for his foster mom when he gets himself into a precarious situation and needs help getting back to his cage. We are working on teaching him to step up more on command. He may let you know gently with his beak when he doesn`t like something, but his body language is easy to read so those situations are rare. He is a very loveable guy. Snowy previously lived with another cockatoo in a cage next to his and a small dog. His current foster parents sometimes sit for a small dog and Snowy is fine with him. Hello, My name is Snowy. I`m a friendly, 20 year old fella who just joined the Mickaboo family. I`m definitely a ladies man who prefers women.